If there is one genre of games that has been weak on the GameCube it is most defiantly RPG’s. Many gamers are deterred by the Final Fantasy style turn based systems and plentiful random battles -- there is just not enough action. Back in early 2004, Namco announced their new addition to the Tales series of games: Tales of Symphonia. This was a surprise entry that appeared in the Cube's barren RPG section. Namco are most commonly associated with arcade games, but this was a step in the opposite direction; a step that proved to be a groundbreaking Gamecube RPG. 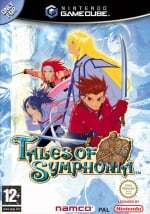 The appeal of Tales of Symphonia is that it’s an active combat RPG: you don’t have the static menus from which you choose your attacks in turn. Instead you move about and use attacks from a combination of shortcut commands. Movement is limited to a linear path (left or right), though in this case linear does not mean limiting. When you get into battle most of the time you control Lloyd, whilst the other characters are all AI…AI that works! You have the option to create shortcut keys for allies moves, so at the press of a button you can get Colette to unleash an awesome mana attack or heal. You can dodge, jump and block enemy attacks with your skill and unleash wicked combinations when they are most vulnerable. This style of battling makes the combat anything but static: you can't zone out and just press attack because this game keeps you on your toes. Those who have 3 friends can let them participate in the battles, taking over from the AI. The story is stricly one player; it's just the battles your mates can help in. The "tale" is long and full of hidden dialogue -- expect a barrage of emotions and twists 'til the very last second. As expected from an RPG you will feel for the characters as they develop; some are a deep mystery until events about their past are told. Many are told in the main story but others you will have to seek out yourself like the "Skits" and side missions. Skits are little rings of light that appear on the world map and activating these sparks conversations between the characters. If you're a completist you will try to find every possible part to the story and scouring the map for skits can become an obsession! There are voice-overs for the major scenes but many times you will be keeping your literacy skills well trained, especially in skits. The graphics are in a cell-shaded style, but with a more mature look than Nintendo's Legend of Zelda: Wind Waker. The style of the game gives it the feel of an anime and that’s how it was intended -- don't let its appearance put you off as the core gameplay is superb. A couple of times you are given the privilege of seeing some great anime cut scenes: these dont last long but are great to see. The detail inside the towns and levels is commendable; a secret is hidden almost everywhere and the detail stays true to the anime style. The world map is the game's biggest disappointment. It’s a primitive design with enemies appearing as generic blobs that pop up a matter of feet away -- it would have been acceptable in the last console generation, but not today. Fortunately you don’t spend much time traversing the map, especially later in the game. Aside from this one blip the visuals are superb in all dungeons and towns. In dungeons enemies appear on screen so you can avoid them if you want to; removing the random encounters which are a common complaint in another well-known series of RPGs. Are there “Over 80 hours gameplay” as advertised? Yes and no. Like all good RPGs this game has 2 ways to play through it. If you take a direct approach to completing the story you will get the game finished in around 40 hours -- depending on your RPG skills. Or you can truly complete the game by getting engrossed in the many side quests that gives you the full experience and understanding of the game -- this way is highly recommended and makes for a longer play time. With replaying the great thing is that once you complete the game you get a score in points; based on this score you can make purchases for "cheats" in a new game like "keep current money" and "triple experience," making a replay easier or harder if you so desire. Seasoned RPG veterans will find something new and refreshing here; a break away from tradition. From the first second, a clear coherent story with many side plots is laid out. Features include an excellent battle system with worthy AI, a wide range of music suited to the game and great visuals - but there are letdowns, like the world map. Those who are deterred by stereotypical Japanese RPGs are well advised to give this a try and see how different it is. Best RPG ever IMO. Chrono Trigger 2nd and Fire Emblem being 3rd. Such an incredible Action/RPG. While it can be cliche, and some parts are awfully mind-numbing and pointless (here's lookin' at you, Ymir Forest), there's so much fun to be had that you forget about it. An engrossing plot, awesome characters (Kratos FTW), and an incredibly enjoyable battle system (bit like SSB, actually) make this one of my favorie Gamecube titles. Now I'm just hoping Tales of Graces makes it to America. This astounding game deserves a 10/10! It's my fave rpg ever!!! It's got a great story, awesome characters, (especially Kratos) a brilliant battle system and a wonderful soundtrack. This is easily the best game on the gamecube, IMO. But it is not just my favourite rpg ever and my favourite GC game but also my favourite game ever! Is this is NL first game review? Seriously best game. I've beaten it 12 times (rounding 13), 100%'d the collectors book, and have had 3 all nighters entirely dedicated to speed running it (12.5 hours best) and this game still hasn't gotten old for me.